0 A Prayer of the afflicted, when he is overwhelmed and pours out his complaint before the Lord. even holy men such as the psalmist. The affliction can overwhelm us. we should do what the psalmist did. even as your best friend or your father wants to hear of your struggles. to ask your brethren to pray for you. pour out your soul to the Lord. it is telling Him what ails you. It is not our job to tell Him how to do His job. We submit our wishes and He acts accordingly. You just have to state plainly what you want from the Lord. Be careful not to demand from Him as though He is your servant. Ask Him to hear what you have to say. For the Lord to answer the call of the psalmist speedily. Do you think the Lord would turn away from such a request? Would not such a request make you want to listen? Give the Lord good reason or reasons to answer your request. Explain to Him how you are doing. Does it matter to you how your family is doing? Did the psalmist have a good reason for the Lord to listen and to respond? The days of the psalmist were going away like smoke. His bones burned like a hearth. Something struck his heart and made it wither like grass. This bothered him so much he forgot about eating. He groaned so much that his bones clung to his skin. This was not a time to be alone. His enemies reproached him endlessly, swearing an oath to get him. Tears mingled with his drink. God’s wrath had lifted him up and cast him away. The psalmist could see his days ending like shadows growing into night. Would the Lord hear such a prayer? How could it not touch Him? 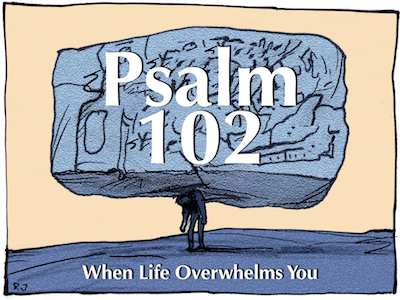 The psalmist was in deep depression. The Lord would act for one of His people in this condition. At verse 12, the psalmist took a new route. here the heart of the psalmist changed. the psalmist knew of victory in the Lord. so that His name is remembered in all generations. proves the point of the psalmist. We are 10,000 miles away. We are 3,000 years down the line. We speak a different language. We have a culture that does not resemble the psalmist’s. He would have favor on Zion. He, and others like him, took pleasure in the stones of Zion. He showed favor to her dust. kings feared the glory of the Lord. that frightens those attacking the people of God. with the church from the first century up to our generation. would not despise such a prayer. The Lord does not rebuke His people for approaching Him in prayer. Revelation 11 shows the enemies of the church fighting her. 15 Then the seventh angel sounded: And there were loud voices in heaven, saying, “The kingdoms of this world have become the kingdoms of our Lord and of His Christ, and He shall reign forever and ever!” (Rev 11.15). now a generation not yet born at that time, praises the Lord. This shall stay written for all future generations. 35 “Heaven and earth will pass away, but [the] words [of Jesus] will by no means pass away” (Matt 24.35). the Lord wants us to know what He thinks of us. declared the name of the Lord. His name triumphs over all. more than Israel serving the Lord. Shortly, you will see why the psalmist included more than Israel. We grow old and die. sin entered the world and death through sin. Notice the powerful contrasts in verses 25–27. The Lord created the heavens and the Earth. Therefore, the Lord outlasts the heavens and the Earth. so the Lord will outlast the creation. so the Lord changes the creation. His children will last forever. He will always be present to hear our prayers. Did verses 25–27 sound familiar? Hebrews 1 argues that this passage speaks of Jesus! That means the whole Psalm refers to Jesus our Lord. That means that Lord, Jehovah, or Yahweh is Jesus. Then the writer showed why the Lord is God. He laid the foundation of the Earth. The heavens are the work His hands. Jesus created all that you see. Jesus is your ever present help.